It's really quite simple, isn't it? And yet, even in this, I need God's help to do it. thank Me for what I've already done". When I do, peace comes to my mind and heart. I LOVE your prayer mobile! God wants to be involved in every aspect of our lives. I love that we can talk to Him as a friend. Have a blessed Sunday! God has been speaking to me to pray about some of the things I used to pray about that I had let drop by the wayside. Nothing is too small or too big to pray about! Love your thoughts and your prayer mobile, Elizabeth. Blessings for 2014. Thank you, Patricia! God bless you this year as well! I love the little birdies and the verse. It is so very true & I surely need to be reminded. I am so glad that He calls me to Himself when I forget! Me, too! God has been reminding me to pray about some things that I used to pray about but have let drop away. 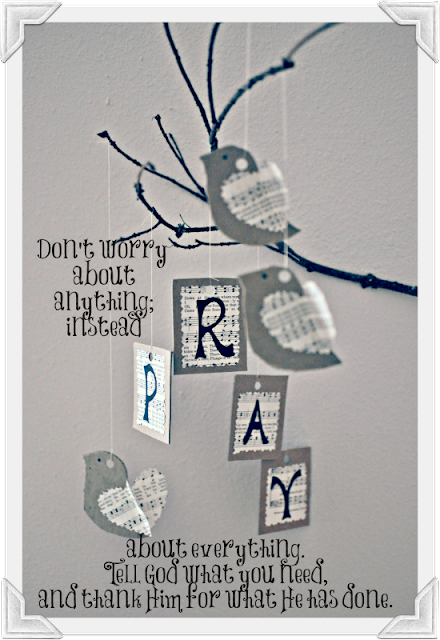 Nothing is too big or too small to pray about! Happy Saturday! Oh..I added a page to my blog that focuses on my word for 2014. I so love that we have the same word and look forward to seeing how God uses this word in our lives this year. Joy is such a beautiful word! I love the mobile... so pretty. I agree, prayer is the power connection.. I hope to increase my prayerlife this year... seeking him more and learning to listen as he answers... Thanks for the post. Blessings! Thank you, Patty. Prayer is the power connection...I like that! oh yes, Elizabeth ... and to thank Him, with some kind of expectancy, for what He's going to do ... that's the hardest prayer of all. Yes! Thanksgiving precedes the miracle as Ann Voskamp says! I LOVE your prayer mobile - I think me and my girls need to make a similar one! We have a song of this verse and it's running through my head right now : ) Have you heard of Seeds Family Worship? It's Bible verses set to songs and my girls (and I) have learned so many verses this way. Each cd comes with 2 copies - 1 to keep and 1 to give away. Your grandkids might love them! Jill, what a fun project to do with your girlies. You could made the birds with more colorful card stock and scrapbooking paper for the wings. Your prayer mobile is beautiful. What a great reminder of the scripture! Blessings!!! 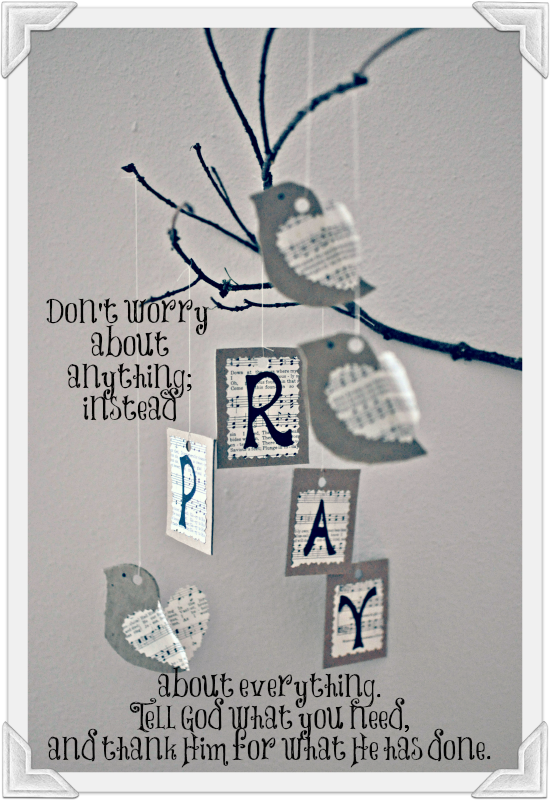 I'm not always consistent at turning from worry to prayer, but I'm doing it more and more. I love the birds and the words. Jedidja, it was a fun and easy little prayer reminder to make! One of my favorite scriptures, Elizabeth! Sweet little birds - what a lovely reminder to do what, as you say, should be so easy. Have a blessed week! Thanks, June! I'm so glad it blessed you! The mobile is lovely; the verse is encouragement for us. Blessings for this first weekend in the New Year! Bless you too, Carol! Praying that 2014 is blessed! Thank you Elizabeth. I needed this reminder! Just a little note to express my appreciation for all your encouragement and wisdom in the Lord. You're a treasure. You blog is always so peaceful...I can imagine that your home is too with that beautiful mobile. Blessing to you in the new year, friend! Oh Marty, I'm so blessed that you find peace here. It's definitely God, not me. Elizabeth. Love your pray mobile. Good reminder to have around. Thank you for sharing. Blessings to you for the new year! The Joy of The Lord is your strength! Have a awesome day! Thank you, Carol. It was a fun and simple reminder to make. I love your mobile! I am thinking of ways to display my verses this year...this is giving me ideas! This morning I was reading again about "praying continually." A good reminder. Good thinking and sharing and reminding as usual. Thanks much. You are right, He wants us to talk to Him about everything...isn't that amazing! I need His help too. Every day. No other way. Love your mobile!! !